When we think of the way our skin ages, fine lines, wrinkles and sagging are usually front of mind, but brown spots and uneven skintone are also a factor. While a smattering of freckles is often deemed ‘cute’ in our youth, larger areas of pigmentation – those uneven patches of brown skin on the face, décolletage and hands – are much more bothersome as we age and can add years to our appearance. If we could turn back time, I’m sure we’d all slather on the sunscreen and sunblock to protect our delicate young skin from the sun’s harmful ultraviolet rays. But it might interest you to know that the sun isn’t the only culprit when it comes to skin discolouration, known as hyperpigmentation. In fact, there are numerous factors at play, including hormonal imbalances, acne, chemical reactions and even eczema. 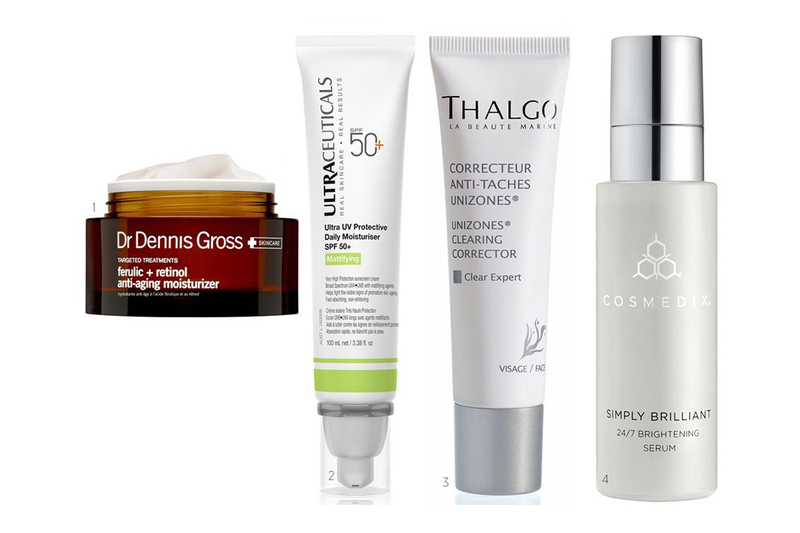 The good news, according to Dr Geoffrey Heber, founder of Ultraceuticals skincare, is that hyperpigmentation can be treated. Here, we delve into three of the main causes of this patchy problem and identify the whitening and brightening products that can help tackle it. This type of pigmentation typically arises in response to inflammation or trauma to the skin and can affect both the face and body. “This can be anything from acne scarring, post-IPL [if you went into the sun after treatment], burn-on-burn, a chemical reaction or eczema,” says About Face founder Marianna Glucina. Flat spots of discolouration, known as macules, can range from pink and red to brown, depending on skintone and the depth of the pigmentation. They can look like small, discoloured freckles or larger patches of darker skin and may be shiny or look like ‘new’ skin. “The discolouration is down to the skin’s melanocytes [pigment-producing cells] going into overproduction when trying to heal a trauma,” says Glucina. Luckily this can be treated successfully. “Our gold standard for post-inflammatory hyperpigmentation reduction would be laser treatments such as Fraxel or Clear + Brilliant,” she says. “We also use Omnilux Light Therapy if the pigment is recent and if there is a need to reduce inflammation,” she says. As with all treatments, good at-home aftercare is required to achieve the best results and Glucina recommends using skincare containing tyrosinase inhibitors and high-strength vitamin A, C and E. “Over time, pigment will be reduced as long as you’re also using proper sun protection with a broad-spectrum SPF 30+,” she says. One of the most common causes of hyperpigmentation, melasma (also known as chloasma) is a skin condition which usually occurs in women and can be influenced by both solar radiation and hormones. “The causes of hormonal pigmentation are complex but there are several triggers, including sun exposure, pregnancy or hormone treatments, including the oral contraceptive pill,” says The Skin Institute brand manager Tracy Goodes. Melasma commonly appears as blotchy patches of brown skin on the face, particularly on the forehead, cheeks and upper lip.The condition is more common in darker skins and is not always completely curable, but it can be treated to reduce its appearance. Goodes recommends using melanin-inhibiting ingredients like niacinamide (also known as vitamin B3) and hydroquinone. “Topical niacinamide has been shown to suppress the distribution of pigment from the cells where it is made,” she says. “It’s an extremely effective and gentle long-term maintenance therapy for pigmentation and can be used in conjunction with hydroquinone to enhance the initial treatment process. At night, regular use of a vitamin A compound called retinaldehyde will also help to inhibit pigmentation by blocking pigment-stimulating enzymes,” she adds. Melasma is definitely more stubborn and unpredictable than other types of pigmentation. “This is because the melanocytes have become sensitised and continue to produce extra pigment with even the slightest hint of sun,” says Goodes. The main culprit of pigmentation is overexposure to the sun’s damaging ultraviolet rays, which induce free radicals in the skin’s cells that damage their structure and function. “These free radicals also trigger the production of melanin pigment from cells as a measure to protect the skin from further sun exposure,” says Dr Heber. “Over time, as the melanocytes become damaged themselves from sun exposure, their pigment production becomes patchy, resulting in dark spots and generally mottled pigmentation,” he says. When it comes down to which rays are the most damaging, Dr Heber says UVA and UVB contribute to skin pigmentation to an equal degree. So can this type of sun-induced pigmentation, called photoageing, be treated? The answer is yes, but treatment is only effective if you stay out of the sun. In addition to applying broad-spectrum sunscreen daily, Dr Heber recommends using a combination of exfoliating ingredients, such as retinol and alpha-hydroxy acids, in your skincare regime or when having a professional facial. Dr Dennis Gross Skincare Ferulic + Retinol Fibroblast Anti-Ageing Moisturiser, $119. 2. Thalgo Unizones Clearing Corrector, $110. 3. Cosmedix Simply Brilliant 24/7 Brightening Serum, $83. 4. Ultraceuticals Ultra UV Protective Daily Moisturiser SPF30+ Mattifying. SK-II GenOptics Spot Essence, $358. 2. SkinMedica Lytera Skin Brightening Complex, $212. 3. 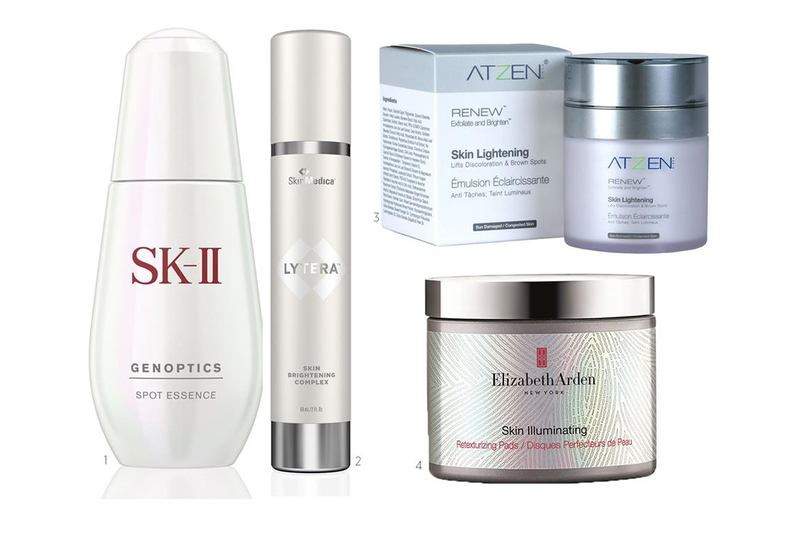 ATZEN Renew Skin Lightening, $116.10. 4. Elizabeth Arden Skin Illuminating Retexturizing Pads, $82. Shiseido White Lucent Micro Targeting Spot Corrector, $249. 2. 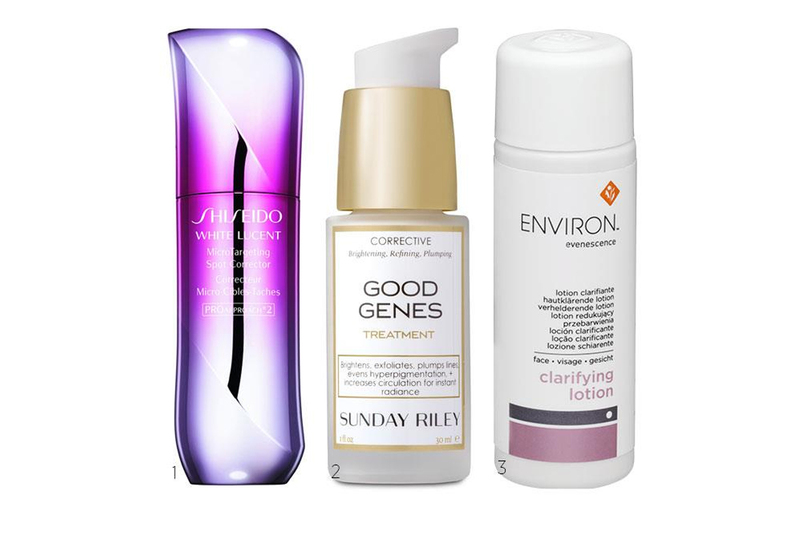 Sunday Riley Good Genes All-In-One Lactic Acid Treatment, $167. 3. Environ Evenescence Clarifying Lotion, $96. 4. REN Bio Retinoid Anti-Ageing Concentrate, $99. Do you have pigmentation? How do you care for it?